A new English language cookbook of Ukrainian cuisine is drawing rave reviews for its serious culinary content and production values, including its stunning photography. This book memorializes the Ukrainian dishes produced by this immigrant family's four cooks (a grandmother, two aunts and the author's mother) during their first ten years in America. It's topics extend well beyond three recipes for borshch and nine recipes for varenyky to include 18 recipes for zakusky (appetizers, salads and condiments), eleven recipes for supy (soups), 20 recipes for osnovni stravy ta harniry (main dishes and sides), 14 recipes for boroshynyani stravy, kashy ta khliby (flour dishes, cereals and breads), 22 recipes for solodke (desserts) and several recipes for napytky (flavored vodka). This book also includes traditional menus for Sviata Vechera (Christmas Eve) as well as preparations for Easter, both Sviachene (the Easter basket) and Roshovliannia (Easter breakfast). This meticulously crafted volume includes informational sidebars concerning contemporary preparation and procedural steps as well as an English language index, including transliteration of Ukrainian names for various dishes. This book features extensive color photographs of finished dishes, as well as occasional photos of the author's family taken on special occasions during the family's first decade in America, between 1949 and 1959. The author is Jaroslawa Zelinsky Johnson, well known Ukrainian-American attorney who has worked in Ukraine for the past 20 years as managing partner of an American law office in Kyiv. The author's longstanding avocational interest in Ukrainian cuisine is convincingly displayed by this beautifully published Legacy of Four Cooks, Recollections of Ukrainian Home Cooking, in which the author reconstructs from memory the gastronomic and visual appeal of more than 90 recipes produced by her large immigrant family's communal kitchen during its first decade in America. 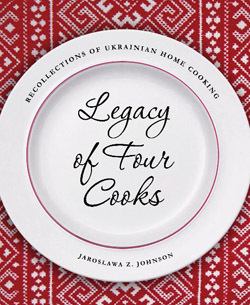 Legacy of Four Cooks, Recollections of Ukrainian Home Cooking by Jaroslawa Z. Johnson, available only at www.blurb.com, is a perfect gift for Mother's Day, new brides and anyone who loves Ukrainian food.